Virginia Housing Development Authority: 2016 Affordable Housing Awareness Week – Can You Help? 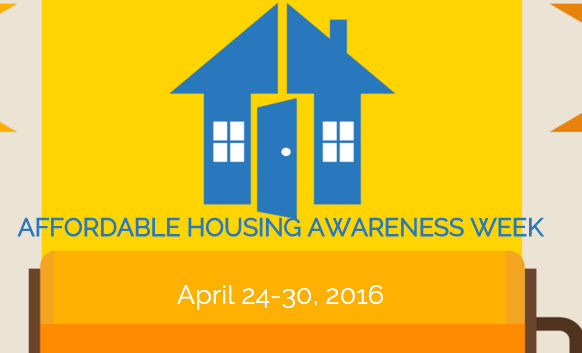 2016 Affordable Housing Awareness Week – Can You Help? (AHAW) — an event that benefits hundreds of members of the Richmond community. Many local businesses gather a team of employees to work alongside both the non-profits that are building and repairing homes and homeowners in need. VHDA is a Leader Sponsor for this year’s AHAW. Since the event began, more than 4,000 volunteers have participated at over 350 worksites, improving the quality of life for hundreds of Richmonders. Many more have learned about affordable housing issues within our community and, as a result, have become more active and engaged in making a difference. This year’s events will include a discussion on Tuesday, April 26, presented by Ashley Hall of the Capital Region Collaborative titled RVA Snapshot: How our Regional Baseline Indicators Link to Housing . On Thursday, April 28, Homeward has coordinated “Walking in their Shoes,” a homeless simulation that gives community leaders the opportunity to assume the identity of someone who might be experiencing homelessness. The simulation asks them to navigate the many daily challenges faced by our region’s homeless population, including finding food, shelter, transportation and needed resources. In addition, volunteers can choose to help with activities throughout the week including Paint, Scrape & Finish It, Shed and Deck Construction, ReStore the Store and Landscaping. See the list of events and register.